Effigy pipes were often self-directed in that the anterior side of the effigy faced the smoker. In this example, however, the smoker would be looking at the posterior side. 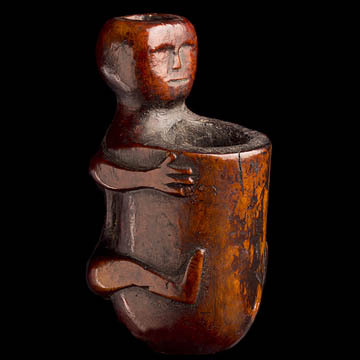 A male figure hugs the pipe bowl, as a bear would huge a tree. The carving of the head is stylistically typical of the Eastern Woodlands with reductive features, combining the eyes and nose.